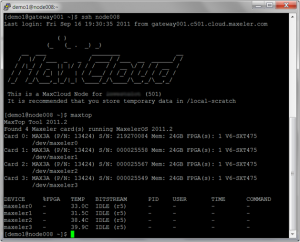 MaxCloud is the industry’s first cloud implementation of a high performance dataflow computing system. It offers businesses a scalable off‐site resource to eliminate upfront hardware costs and deployment time while benefiting from the high performance of dataflow computing. MaxCloud compute nodes are optimized for high performance computing, combining multi‐core x86 CPUs with multiple Maxeler dataflow compute engines, large memory systems, fast disks and running an industry standard Linux distribution. Each compute node typically provides the performance of 20‐50 standard x86 servers. Access to MaxCloud is provided via SSH or VPN. Nodes are allocated to users on a daily granularity, with a minimum allocation period of 7 days. 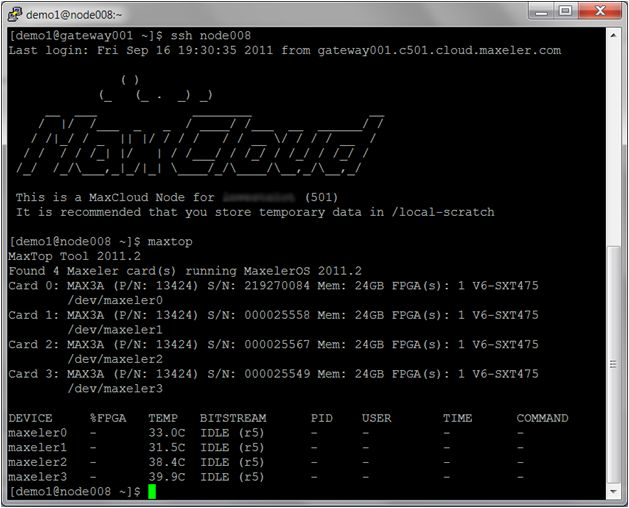 MaxCloud nodes are MPC-C500 machines with 12 Intel Xeon CPU cores, 144GB of RAM for the CPUs and 4 vectis dataflow engines. Each dataflow engine has up to 24GB of RAM, giving a total of up to 96GB of DFE RAM per node. DFEs within the same node are directly connected with high‐bandwidth MaxRing interconnect. 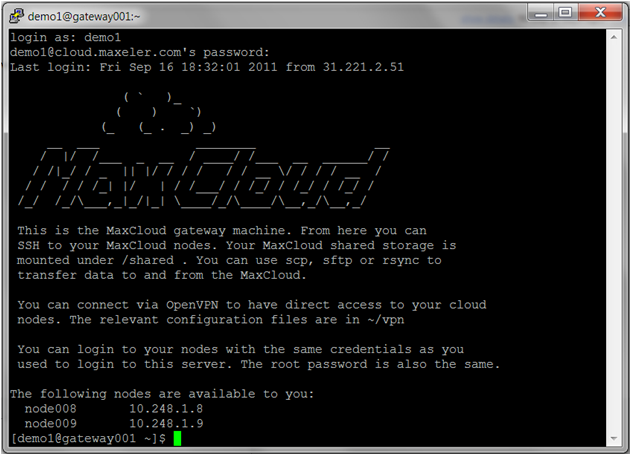 MaxCloud provides benefits both to new and existing users of Maxeler technology. For those already using Maxeler platforms to run their applications, MaxCloud provides a way to provision computation resources only when they are required for production jobs, and without resorting to capital expenditure. For those new to the technology, MaxCloud is an environment where the technology can be evaluated, and application development can take place while a hardware purchase is being specified, built and delivered.